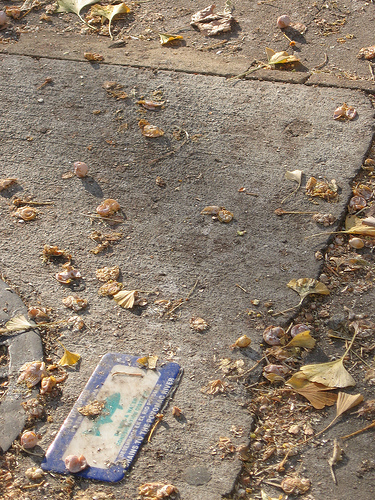 To prevent the notoriously unpleasant odor of the popular ginkgo tree (Ginkgo biloba) from overtaking city streets, the District Department of Transportation’s Urban Forestry Administration (DDOT Trees) will begin spraying the unsavory smelling female ginkgo fruits tonight. DDOT Trees will use the same spray that has been used for the past several years, Shield-3EC 24(C). Spraying will begin in Wards 1, 2 and 6, where female ginkgo trees are most prevalent, and continue through Wards 4, 3, 7, 8 and 5. Spraying will occur overnight for the next few nights and there is no need to move vehicles parked on streets. For additional information please contact DDOT Trees at 202-671-5133. Matt lamented this unpleasantness a couple of years ago. Anyone notice the smell this year?